Gault at 50 Honors #HispanicHeritage Month: In September, the Gault at 50 Campaign is highlighting Hispanic and Latino youth. Juvenile courts and the people working within them must be culturally sensitive and attuned to the unique needs and circumstances of all youth and families. August 2016 Newsletter: Watch NJDC Executive Director Kim Dvorchak speak at TEDxFoggyBottom; Gault at 50 highlights #BackToSchool; NJDC and the National Council of Juvenile and Family Court Judges co-publish judicial policy statement. July 2016 Newsletter: NJDC releases the Gaultat 50 Campaign Toolkit; overview of JTIP Summer Academy ’16; join us in Atlanta for a Gault reception! Gault at 50 Celebrates #JusticeForAll: In July, the Gault at 50 Campaign focused on #JusticeForAll and fulfilling the promise of our nation and the constitutional rights we’re endowed. NJDC Co-Publishes HuffPo Blog: In partnership with the Movement Advancement Project, NJDC published a blog in the Huffington Post on the role of juvenile defenders in empowering LGBTQ youth who are caught in the juvenile justice system. Gault at 50 Kicks Off #PrideMonth: NJDC commemorates #PrideMonth as the first of its monthly themes for the Gault at 50 Campaign. Strong juvenile defense lawyers lead to better outcomes for LGBTQ youth. May 2016 Newsletter: The Gault at 50 Campaign launch and Statement of Principles; an unforgettable night at the JusticeAid benefit concert; and efforts to promote specialized juvenile defense practices. April 2016 Newsletter: The upcoming Gault at 50 Campaign launch on May 16, 2016; NJDC at TEDxFoggyBottom; our analysis of probation orders; and the JusticeAid benefit concert. 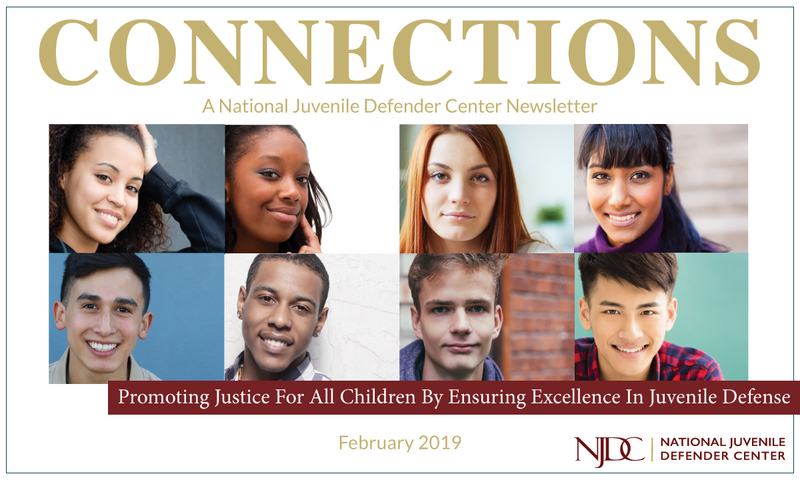 March 2016 Newsletter: Check out NJDC’s first e-newsletter! Learn more about the Gault at 50 celebration; the JusticeAid benefit concert on May 15, 2016; our Smart on Juvenile Justice work; and our staff.